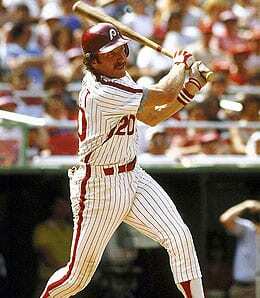 On Thursday it was reported that Hall of Famer and all-time Phillie great Mike Schmidt is dealing with an undisclosed health issue that will prohibit him from being a guest instructor at the Philadelphia Phillies Spring Training camp this year. Now 64, Schmidt’s plan is to visit the camp in the middle of March, but for the first time in over 10 years, he won’t be an instructor, opting instead to “remain near his doctors,” according to a statement released by the team. Schmidt will also visit Philadelphia throughout the summer if things go according to plan, but of course, we have no idea how serious his ailment is. But if it’s serious enough that he doesn’t want to be far away from his doctors, that’s a big concern. We can only hope for the best. Growing up as a Phillie fan, we were always a huge supporter of Schmidt and watching him dominate in his heyday in the mid to late ’70s is among our favourite baseball memories. He epitomized “feared slugger” in his day. Guest instructors for the Phillies this spring will include the recently retired Roy Halladay, Brad Lidge, Dave Hollins, Gary Matthews and Larry Anderson. Justin Verlander, currently recovering from core muscle surgery, could miss the start of the season. Pay close attention to this situation as Spring Training nears. Despite reports Thursday that suggested they have a four-year, $52-million deal in place with Matt Garza, the Brewers are denying a deal exists. GarzaGate is on, baby! Apparently, the ChiSox have agreed to a multi-year extension with manager Robin Ventura despite the fact they won just 63 games last year. Chicago White Sox: rewarding ineptitude since 1900. This entry was posted on Friday, January 24th, 2014 at 2:29 pm	and is filed under BASEBALL, Fantasy Notes, RotoRob. You can follow any responses to this entry through the RSS 2.0 feed. You can skip to the end and leave a response. Pinging is currently not allowed.